St. Clare was the first Franciscan woman, a follower of St. Francis. 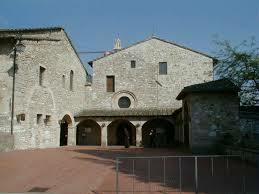 Together they founded the Second Order of the Franciscan family, the Poor Clares in 1212. She lived in the church of San Damiano which St. Francis renovated for the Sisters to live in, for almost 40 years until her death. To the foundation of Franciscan poverty and simplicity of life, Clare added the contemplative vision, bringing a unique gift to the Church. The combination of evangelical poverty and simple, Gospel living, with the silence and solitude of contemplative life within enclosed community, is Clare’s legacy to her sisters and the Church. Clare’s first Rule was modified by the Pope, but she remained true to the vision God gave her and, on her deathbed, secured for the Order the “privilege of highest poverty.” Thus, her desire was affirmed to depend totally on God’s providence and live the Gospel wholeheartedly. Today, the Poor Clares form a worldwide Order of more than 17,000 sisters in 900 monasteries, 42 of which are in the United States. All follow the same Rule and share the same basic Constitutions. Yet each monastery remains totally autonomous, with its own abbess, chapter of professed sisters, and novitiate. Each community gives expression to its own particular nuancing of Clare’s spirit. 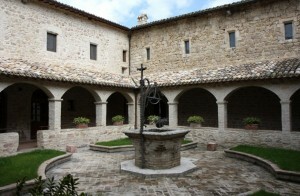 In this way the Order’s “form of life” can be as wide as the world and as unique as each particular monastery. From the oldest monastery in Assisi to the latest foundation in the world, the central elements of the Poor Clare life remain the same. Each monastic day provides the opportunity for long periods of personal prayer, as well as the enrichment of Eucharistic celebration and its continuation through the Liturgy of the Hours. Silence and solitude, so necessary to contemplative life, are balanced by close community living and the warm support of sisters who truly love each other. Simple manual work is another staple of the life, contributing toward the material support of the sisters and giving expression to their desire to serve others. Since theirs is a purely contemplative call, the sisters do not directly engage in any apostolate outside of the monastery. Following Vatican II, the ideals of Poor Clare living have been renewed and the Order’s Constitutions have been updated. Within the approved constitutional framework each Chapter makes decisions about particular expressions of enclosure, contact with those outside of the monastery, types of work and daily schedules. Such adaptations are accidental differences; the Poor Clare spirit of evangelical poverty, prayer and contemplation remains essentially the same. Over the 800 years since St. Clare and St. Francis founded the Poor Clares, there have been times when both the friars and the Poor Clares needed reform. There have been courageous women and men who responded to that call by challenging the status quo and/or beginning new branches of the family. Thus, the friars today are: Friars Minor(OFM), Conventual Friars (OFM Conv), Capuchin Friars (OFM Cap) and Third Order Regular Friars (TOR). Likewise, today there are a variety of Poor Clare expressions; besides us (OSC), there are Colettine Poor Clares (PCC), Capuchin Poor Clares (OSC Cap) and Poor Clares of Perpetual Adoration (PCPA). If you are interested in these other branches, we encourage you to look for more information about them on the Internet.